Cattaraugus County may be the best kept secret in the Western New York birding community. With the largest state park in New York, more than 33,000 acres of state forest, and a major migratory corridor to the Mississippi flyway, Cattaraugus County offers birders unparalleled opportunities. 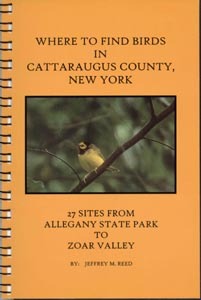 This guide, subtitled 27 Sites From Allegany State Park to Zoar Valley, gives detailied directions to 27 sites, indicates when the site is good and when it is best, lists the birds that may be encountered, and describes the character of the site. The book also includes a seasonal abundance chart, a list of birding points of interest near Cattaraugus County, a list of useful telephone numbers, and a list of where to find food and lodging in Cattaraugus County. Without it, any visit to the county is incomplete. Author Jeffrey M. Reed also writes the birding column that appears in the Olean Times Herald.